The power of the web, without all the noise. Find EXACTLY what you seek. Generate ideas at a rapid fire clip. Lateral, associative searches provide immediate inspiration. You see above a detail of our IdeaBrowser. It’s the lateral / associational thinking engine built into every copy of ThoughtOffice. It allows you to explore your ideas and bring back lots of words, phrases, images and ideas from your initial search. IdeaBrowser Tabs are how you access various types of information, and bring it into your Brainstorming Session. 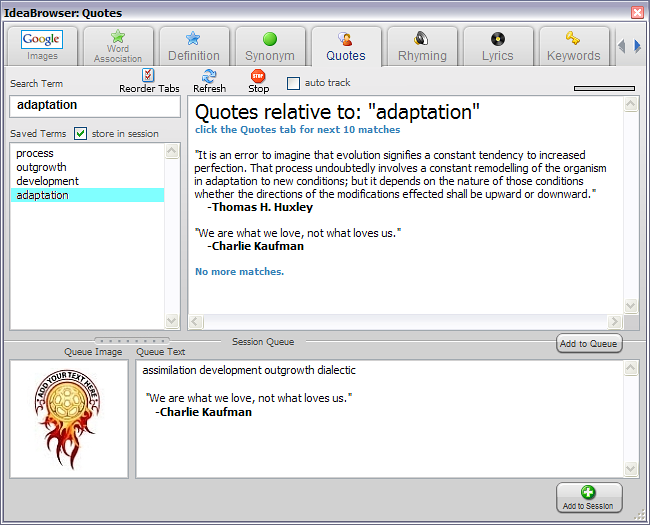 ThoughtOffice includes tabs for Definitions, Rhyming words, Lyrics, Synonyms, and Hypernyms. Even millions of keyword-tagged images. And we are developing additional tabs that will help you explore everything from religious texts to the latest scientific research. Check back soon. We’ll have more creative, research and idea-generating elements than you’ve ever imagined. And please, PLEASE let us know if you have some ideas for content that would be valuable to our users. Simply send us your request, provide a web link or two to similar (or the exact) content and we’ll put it on our list of databases to acquire, develop or partner with. Click here for the InnovationTools.com review of ThoughtOffice.